This wizard guides the user through the process of estimating radiation dose based on calibration curve and one or more test samples. The wizard consists of a series of screens. To move forward to the next screen click “Next”, and previous screens can be viewed and edited by clicking the arrow on the top left of the wizard dialog. To open the wizard, click “Wizards” in the menu bar at the top of the software window and select “Dose Estimation”. Before proceeding to the next steps of the wizard, several prerequisites are necessary. One or more Processed test sample(s) must be present within the main GUI. Make note of an appropriate sigma value which will be chosen throughout the course of this wizard. Calibration curves present in the main GUI under the heading Curves are shown in the dropdown box here. 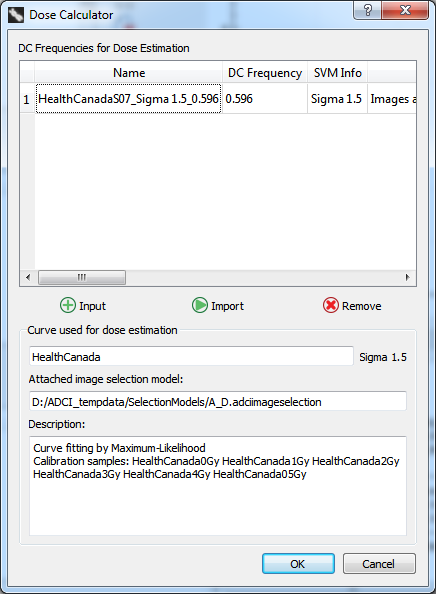 Once a curve has been selected, the image selection model and SVM sigma value of the curve will be displayed. This is the calibration curve which will be used to estimate dose. If no curves are present in the dropdown, please ensure a curve is present in the main GUI. To learn how to create or open a saved curve to populate the curve section of the main GUI visit the calibration curve page. Processed samples contained in the Sample list within the main GUI are listed here. If samples are present in the main GUI but the the list in this slide of the wizard is blank, the samples must first be processed. Place a checkmark beside a sample to examine its dose. Note it is not necessary to place checkmarks beside calibration samples. 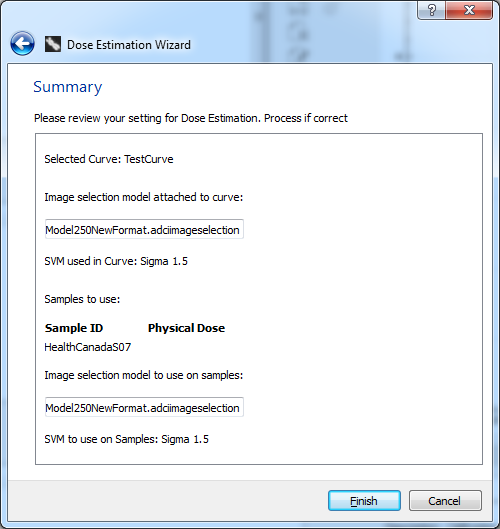 In fact, it is not necessary for calibration samples to be present in the main GUI at the time of dose estimation. Calibration samples were taken into account at the time the calibration curve was created. The first half of this screen displays the image selection model applied when the selected calibration curve was created. It simply displays the properties of the model and these fields cannot be modified. Before clicking “next” please continue reading the next heading which finishes describing this screen. 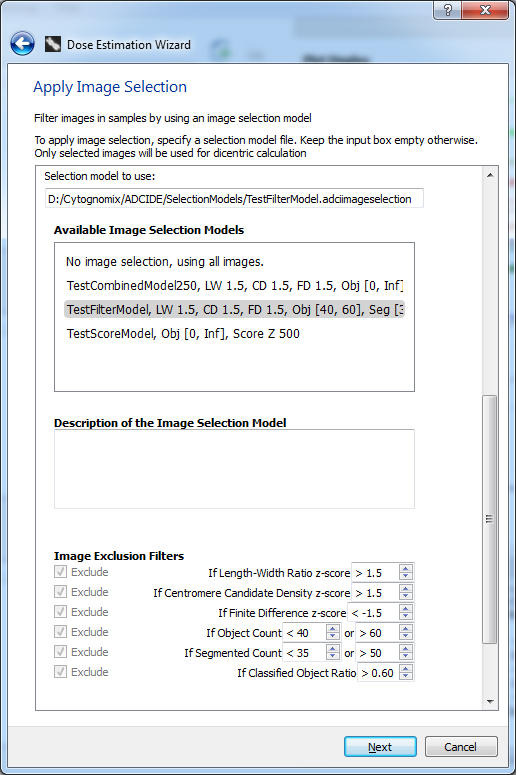 An image selection model may optionally be applied to the previously selected test sample. It is highly recommended to use the same image selection model which was used to generate the calibration curve selected previously in the wizard. The image selection model used when creating the curve has been prepopulated under “Selection model to use”. To use a different model, highlight an entry within the list of “Available Image Selection Models”. 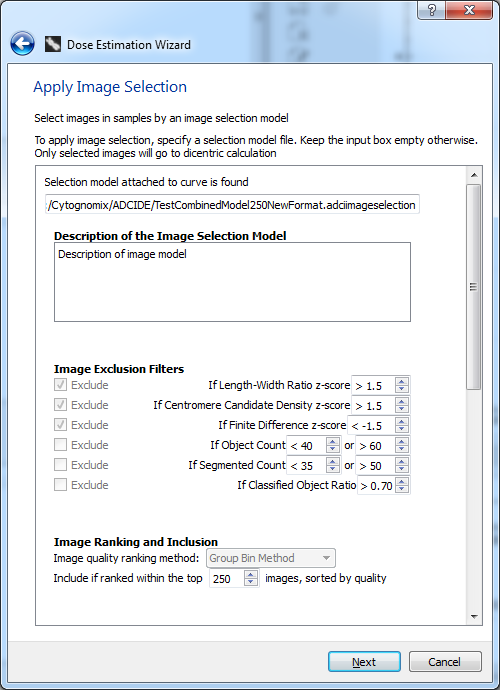 The description of the model, Image Exclusion Filters, and Image Ranking and Inclusion fields will be automatically populated using values from the selected image selection model. To clear a model, highlight “No image selection, using all images” and the fields on this screen of the wizard will be emptied. Note modifying the prepopulated “Selection model to use” is not recommended. Image selection models choose the “best” images from samples based on a series of filters and the model present at the time of curve calibration influences the SVM. If images are chosen from the test sample based on different criteria, the results may not be as accurate. It is highly recommended to choose the same SVM sigma value used to create the selected calibration curve. The SVM sigma value used when creating the curve has been prepopulated in the sigma dropdown. For more information on choosing an appropriate SVM sigma value to use please consult the SVM sigma page. As a general recommendation, we have found SVMs based on 1.4 ⇐ σ ⇐ 1.6 maximize the combined true positive rate and positive predictive values compared to manual or ground truth scoring of dicentric chromosomes by experts 1). Similar to choosing an image selection model on the previous page, it is not recommended to use a sigma value different than the sigma value used at the time of calibration curve creation. Dicentric chromosome counts are influenced by the SVM sigma value. If overall dicentric chromosome counts within test samples and calibration samples are made based on different SVM sigma values, the results may not be as accurate. Ensure your previous selections are correct on this summary screen. Note values entered on previous screens can be edited by clicking the blue button on the top left of the wizard dialog. Click “Finish” to complete the wizard and bring up the prepopulated “Dose Calculator” dialog. 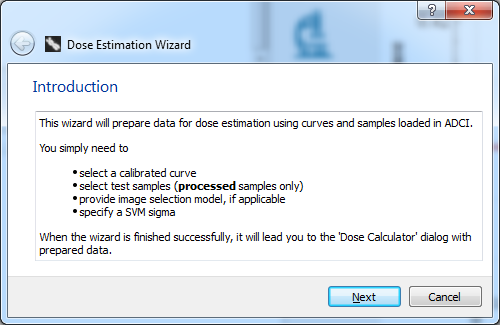 The dose calculator dialog has been prepopulated based on your selections during the wizard. 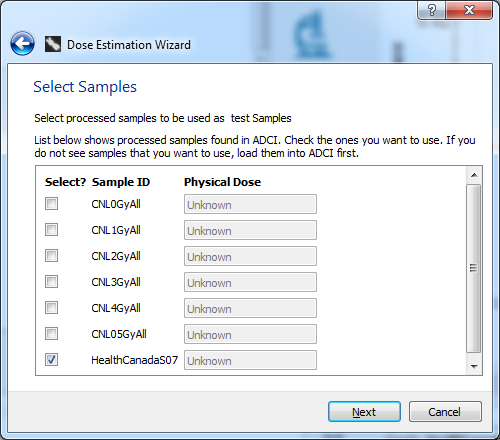 Simply click “OK” to perform dose estimation on the sample(s) requested. 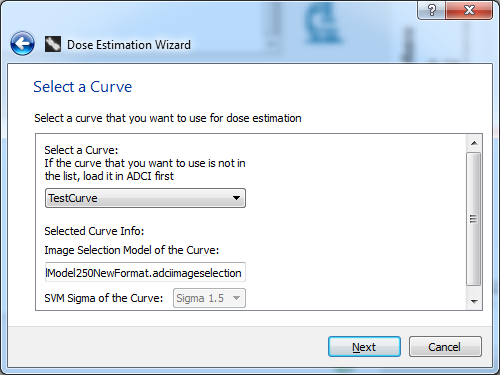 Although it should not be necessary for completion of this dialog since it has been prepopulated by the wizard, more information on its contents can be found within the dose estimation page.